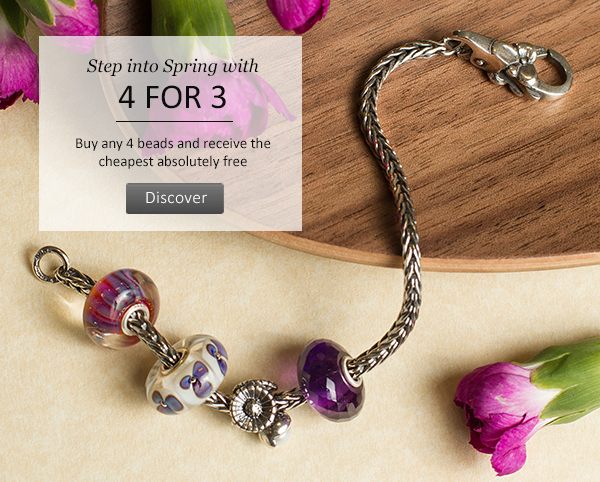 Yesterday, Trollbeads UK announced a special promotion in the form of their ‘4 for 3’ offer. But be quick, it is for one week only! Trollbeads UK campaign image – Please do not reproduce without crediting. The offer was announced via their newsletter yesterday in which Trollbead stated, “For 1 week only we are holding a special offer online of 4 beads for the price of 3! Shop our whole range of beads including silver, glass, pearls, precious stones, full kits and even gold to find a special selection of beads for your bracelet for the new season”. I do not know whether any other Trollbeads retailers will be offering this promotion, but the Trollbeads UK website will ship globally and offers free postage on all UK orders. This offer will undoubtedly please many Trollbeads collectors in the UK and Europe who either miss out on the current US promotion (buy 3 get one free) or take advantage by ordering online from the US but risk being charged import taxes through customs. As stated above, the offer is for 1 week only, ending on 16th April 2015. I would love to hear from any readers who take advantage of this offer what they decide to buy! I love your new format. It loads up nice and quick now and the array makes it easy to select posts I may have missed. BTW your photography is excellent. Thanks.